I recently met Gillian, a smart and resourceful young woman who spent her last two years of high school battling homelessness. She slept everywhere from friend’s attics to strangers’ porches to hiding in garages. Sometimes she stayed with relatives. How she managed that situation and still graduated as the school valedictorian amazes me; when she talks about it, she underplays the situation, saying that others have had it worse. Now she is in college, and I don’t think she will ever be homeless again. She is proof that homelessness can end. Can we learn from her and bottle it to help others? I ask myself that a lot. I don’t like gimmicky ideas or phrases that cover up truth. So, I was leery when I first heard the phrase "Functional Zero." It’s a new concept and refers to a condition where all homeless individuals who want to be housed are able to access permanent housing. Functional Zero is based in “housing first” philosophies that suggest that providing permanent housing is the first and most important step in stabilizing a homeless person’s life. It proposes that someone who is permanently housed is in a better position to addresses other issues like addictions, job searches, and other important issues than someone who is temporarily housed. To reach Functional Zero, we would need enough housing units for our homeless and the supports to keep them housed. That means no one can be in shelters or transitional facilities, like treatment centers. Other people who dislike Functional Zero argue that not all people are “housing ready” for permanent housing, and instead need temporary facilities that help them address mental health issues and addictions. Arguments aside, the rise of the term Functional Zero has generated lots of interest and excitement around the country and has led cities like New Orleans, Salt Lake City and Houston to declare an end to veterans’ homelessness. While many communities may soon join the ranks and announce the achievement of Functional Zero, maintaining that status over time may prove more difficult. Can Indianapolis achieve Functional Zero if it wants to? That requires us to know exactly how many homeless we have. Each year, the Coalition for Homelessness Intervention and Prevention (CHIP) conducts the Point in Time count of homeless. For one night in January, we count all the homeless we can find. While it is only a snapshot of an entire year, it gives us a lot of useful information that helps to estimate the homeless and extrapolate that we have between 5-8,000 homeless in a year in Marion County. Most of these homeless are facing mental health issues, substance addiction and chronic poverty. If we hope to end their homelessness, we also need more mental health and addictions treatment in addition to more affordable housing. They aren’t the only homeless. 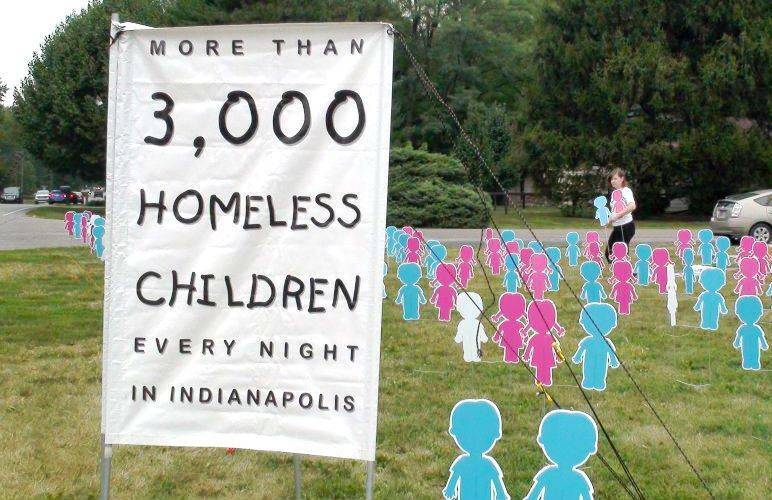 At the same time that we counted 1,666 homeless individuals in the Point in Time count, we also found more than 3,000 children in Marion County schools who were homeless. These kids are part of what I call the "hidden homeless." Most of them are with their parent(s) and have lost their home. They aren’t on the streets. They usually double up somewhere, staying with friends, relatives, or others who will take them. These situations are sometimes safe and sometimes not. When you are a family with children and you become homeless, it is often because of a financial crisis from the loss of a job, a medical bill, or other unexpected financial loss. They need living wage jobs, prevention funding that keeps them housed when a crisis arises, and more affordable housing. Other young people are either abandoned by their parents or run away from bad circumstances. The young woman Gillian that I mention at the beginning of this story was abandoned by her mother and had to learn to survive on her own at a young age. Ending homelessness for this group isn’t as easy. It isn’t even easy to find them. It doesn’t end there. Domestic violence is not only emotionally and physically dangerous, but many of those fleeing their abuser end up homeless or in temporary shelters for protection and lack of resources. For homeless families, domestic violence is the leading cause for their loss of a home. For this group, homelessness and domestic violence are intertwined, and to solve one requires solving the other. Even other pockets of homeless exist. They include people living in their cars, staying at hotels, in jails, hospitalized, or even just hidden from us. Functional Zero isn’t so easy to reach when we count this elusive group. We know that homelessness is a complex issue, so its solutions are necessarily complex as well. I don’t want to paint a bleak picture because there are great successes as well. More and more, studies are showing that getting people housed quickly after becoming homeless will lead to greater stability. We have good data in Indianapolis that shows once we house a homeless person, a year later 92% of them will still be housed. We know that some people need more supportive services, and the best solution is housing subsidies and more housing units. In the end, maybe achieving Functional Zero isn’t as important as getting the resources we need to get there. In 2016, CHIP has been undertaking a comprehensive look at the homeless situation in Indianapolis and considering models that we need to reach Functional Zero. Reaching that elusive goal might seem difficult now, but I can’t help but take inspiration from that brave young lady Gillian who earned valedictorian while homeless in high school. If she was able to reach that, I believe Indianapolis can reach Functional Zero. Alan Witchey is the Executive Director for the Coalition for Homelessness Intervention and Prevention of Greater Indianapolis. He previously worked for United Way of Central Indiana, Orange County AIDS Services Foundation, and The Damien Center. He received his MA from Antioch University Los Angeles and BA from Indiana University.